As Sen. Mark Begich (D., Alaska) seeks to shore up his energy policy credentials, a now-bankrupt green energy company to which he steered federal subsidies could cloud his message. Begich received campaign contributions from a lobbyist for an Alaska geothermal plant after helping the company obtain federal financing. 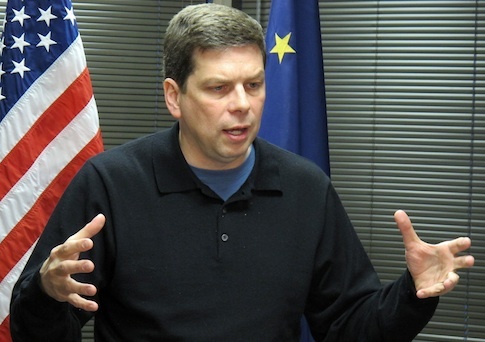 The company is now bankrupt, but Begich continues touting his support for alternative energy. The senator, who is facing reelection in November, will address the Alaska Wood Energy Conference on Wednesday. The conference brings together leaders in the state’s biomass industry. He has also promoted fossil fuel development, including effort to open areas of the Arctic National Wildlife Refuge to oil exploration, and to approve the Keystone XL pipeline. However, Begich’s critics are pointing to his involvement with a now-bankrupt Alaska utility as evidence of a troubling record on energy policy. Begich’s efforts to secure subsidies for the utility paid off on Oct. 28, 2009, when President Barack Obama signed the fiscal year 2010 water and power appropriations bill. Among its provisions was a $2.5 million earmark for the Southwest Alaska Regional Geothermal Energy Project, a project of Alaska utility Naknek Electric Association (NEA), introduced by Begich and fellow Alaska Sen. Lisa Murkowski (R.). The language earmarked funds from the Department of Energy’s (DOE) Office of Energy Efficiency and Renewable Energy for NEA’s geothermal plant. NEA would later praise Begich’s support for the project. "Thanks to sustained efforts by Senators Murkowski and Begich, and Representative [Don] Young, two hard earmarks survived the legislative process" and provided the project with millions in funding, the company wrote. A day after the bill containing Begich’s earmark became law, he took credit for additional federal funding for the project. "The American Recovery and Reinvestment Act is expected to bring $1.6 billion to Alaska over the next two years, creating or sustaining 8,000 jobs," the senator said in an Oct. 29, 2009 news release. "Sen. Begich supported its passage in Congress." The bill included millions in funding for the Southwest Alaska Regional Geothermal Energy Project. Begich has since highlighted his support for the stimulus. "I am the only member of the [Alaska congressional] delegation that voted for the recovery money," he told the New York Times. "You bet I talk about it." His Oct. 29 news release touted three projects set to receive stimulus funding. Among them was NEA’s geothermal project, which was awarded more than $12.3 million in DOE funds. The day the news release went out, a day after Obama signed the water and power appropriations bill into law, Lawrence Markley, an Alaska lobbyist who represents NEA, wrote Begich a $1,000 check. He would later donate another $3,400. Markley also donated to Murkowski and other Alaska lawmakers around that time. Begich’s office did not return a request for comment, but observers say such exchanges between lawmakers and subsidized industries are common. "Alas, such quid pro quo dealings are a necessary element of the green energy business plan," William Yeatman, a senior fellow at the Competitive Enterprise Institute, said in an email. "When your industry’s supply and demand curves are functions of government decisions, as is the case for the entire ‘green’ energy sector, you’ve no choice but curry favor with powerful politicians," Yeatman said. "Bluntly put, obtaining political favoritism requires much less investment than honest competition on the energy market." Despite the subsidies, NEA filed for chapter 11 bankruptcy protection in September 2010, less than a year after Markley’s first contribution to Begich. The company’s attorney, Erik LeRoy, said the bankruptcy filing and subsequent restructuring were efforts to allow the company to continue generating power for its customers despite problems with its geothermal activities. "It stops all of the fighting about the problems that happened over on the geothermal side," LeRoy told Alaska Public Radio. "The electrical side is completely stable," he said. Bankruptcy was an effort to "solve the problem of the overextension of the geothermal side." NEA has since sold off all of its geothermal drilling equipment in an effort to repay its debts during the restructuring process. "NEA will continue to produce electricity, for now, with diesel generators," LeRoy said in an email. This entry was posted in Issues and tagged Green Energy, Mark Begich. Bookmark the permalink.